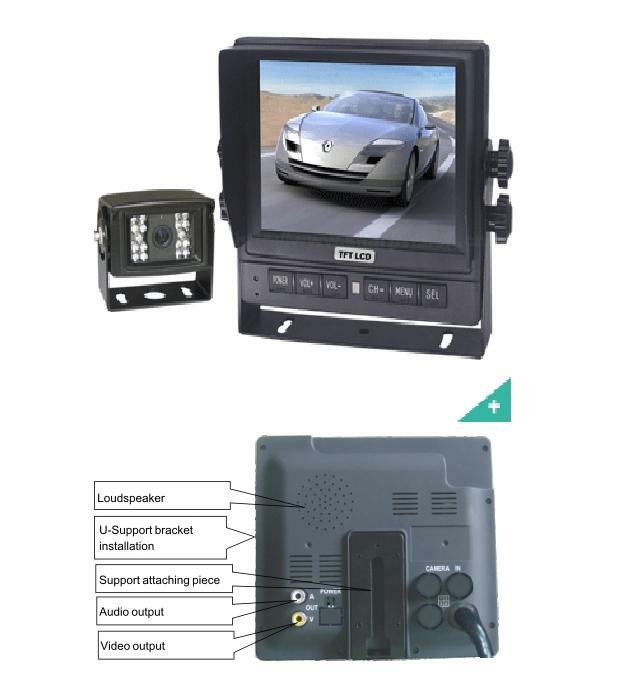 Feature: 5.6" TFT- LCD Color monitor. Audio output: 1W. Loudspeaker: one 4.0cm round loudspeaker. Connectors: Automobile power supply adapter, AV and power cable ,Earphone. Power consumption: about 8W . 182mm (W) x 155mm (H) x 42.5mm (T)(with flush-mount). Dot pitch: 0.118 (H) ~ 0.362 (V). Resolution: 960 (H) ~ 234 (V). Viewing angle: U: 45 / D: 65, R/L: 65. 18 IR LED Night Vision Light let you see clear picture at night at 30ft away. The Camera has has 4pin female screw-on connector. and also system come with RCA Convert cable.